Sunderland have been fined by the Premier League after they fielded an ineligible player in four league matches earlier in the season. Striker Ji Dong-Won, 22, played against Fulham, Southampton, Crystal Palace and Manchester United before Sunderland informed the Premier League they had made an administrative error. It is understood they were made aware of the error in December and Sunderland settled the fine in early 2014. The club will not be deducted points. Sunderland were also fined by the Football League because the player appeared in the Capital One Cup victory over MK Dons in August. Club secretary Liz Coley has left the club but sources at Sunderland insist it was not as a result of the error. Sunderland were fined because they failed to gain international clearance for the South Korea international after he returned to the club from a loan spell at German club Augsburg last season. The Premier League club did not realise they needed to seek international clearance for a second time when he returned to England. He should not have been involved in any matches before the club received written confirmation from the German Football Association. The Premier League has refused to comment. 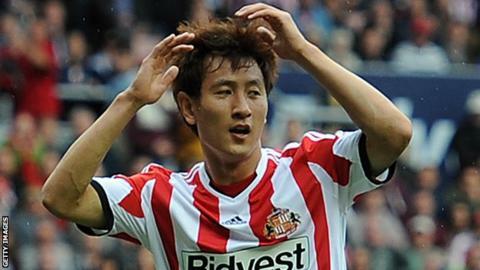 Ji joined the Black Cats for an undisclosed fee from South Korean side Chunnam Dragons in June 2011. Sunderland took only one point from the four league matches in which the striker featured when ineligible, losing 1-0 at home to Fulham on 17 August and drawing 1-1 at Southampton on 24 August, before losing 3-1 away to Palace on 31 August and 2-1 at home to Manchester United on 5 October. Ji also played in the 4-2 victory over Milton Keynes Dons in the Capital One Cup second round on 27 August. In January he re-joined Augsburg until the end of the season but has agreed a four-year deal to join fellow Bundesliga side Borussia Dortmund on a free transfer in July.